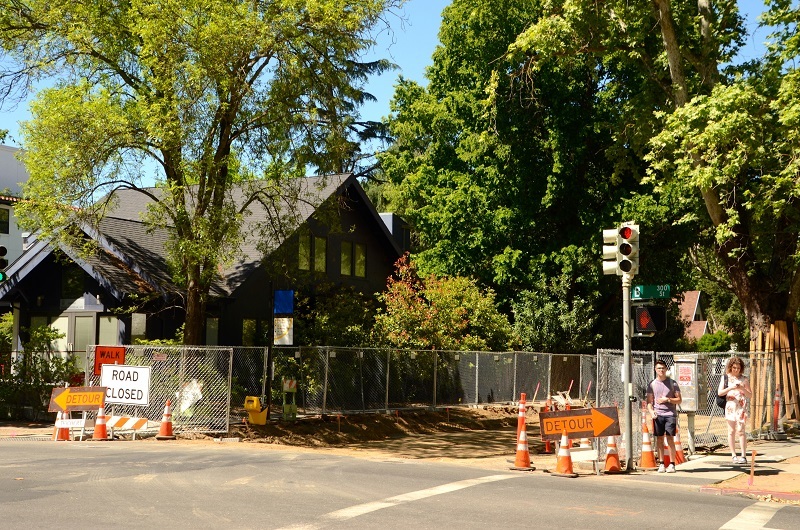 Have you noticed all the construction signs and projects popping up around Davis? There are a lot of projects happening in our city right now including roadway and pathway improvements. In addition to the construction, May is Bike Month in Davis. We want to make sure these projects don’t get in the way of your enjoyment of the many miles of greenbelts, parks and pathways. 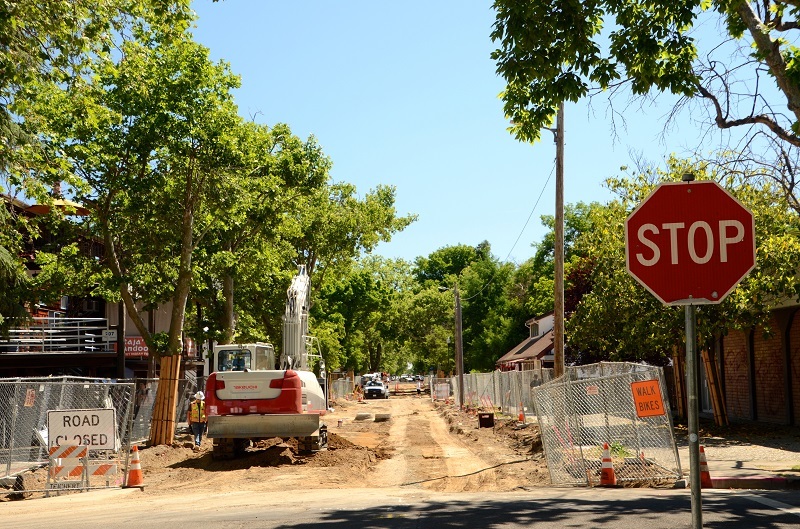 With all this construction on our streets, I wanted to share a list of the City of Davis Transportation construction projects happening this summer and some tips for traveling near, around, and through construction sites. Did you know that the city is required to provide construction detours that are accessible for all roadway users? Providing detours that are accessible for all sometimes means we route bike traffic, pedestrians and drivers on different streets and paths. Detours must be ADA compliant for pedestrians and safe for people on bikes and drivers. The city cannot direct traffic onto private property, including private streets and parking lots. Sometimes detours are not short in length because of the design of the roadway network. You might have to pedal a little longer and walk some more steps, but it is all for safety. And on the plus side, the more miles you bike in May and log on the mayisbikemonth.com website, the more chances you have to win prizes! Plan ahead! Here is a list of the projects currently under construction, or expected to be in the next few months. Project description: JUMP Bike Share will be launching in Davis, Sacramento and West Sacramento on May 17. Bike share is a service-oriented business, which provides shared bicycles to use on a short-term basis for a price. Construction location: There will be 15 bike share locations in Davis. What to expect: There will be minor traffic impacts as work is performed to install bike share stations on and off the street. Planned construction dates: April through Aug.
Project description: This project consists of removal of the existing asphalt street and replacing it with pavers, installation of benches, garbage bins, a news kiosk, new street lighting, an art installation, landscape and irrigation replacement. Construction location: Third Street, between A and B Streets and the intersections. What to expect: This project will have three phases and major impacts to all forms of traffic. The first phase will include impacts to the alleys between B Street and University Avenue. The second phase will begin after Picnic Day and vehicles will not be allowed on Third Street, between A and B but, pedestrians and walked bicycles will be allowed through on the sidewalk area. During the third phase, occurring in the fall, vehicles and people on bikes will be allowed, but pedestrians will be detoured. Construction on 3rd between B and A streets summer of 2018. Photo courtesy Johan Verink. Project description:This project includes replacing the water main and some sewer laterals. The intersection of Covell Boulevard and L Street will be getting a new traffic signal, become an enhanced bike and pedestrian intersection. Along L Street the roadway will be resurfaced with new striping. Construction location: L Street from Fifth Street to Covell Boulevard. What to expect: The project will have major impacts to drivers, walkers and people on bikes and include detours. The contractor plans to work block by block and move as work progresses. Planned construction dates: Mid-April to the end of the year. Construction at L and Drexel summer of 2018. Photo courtesy Johan Verink. Project description: Repair sidewalk and ramps throughout Davis. What to expect: A contractor will be improving sidewalks and curbs around Davis. There will be minor traffic impacts at the intersections and mid-block as the concrete work is performed. Project description: This project consists of installing a cycle track, separated bikeway along Mace Boulevard, modifying the signal at Cowell and Mace Boulevard, installation of assisted pedestrian crossing at San Marino Drive, intersection improvements, reconstruction of the street surface, and new striping. Construction location: Mace Boulevard from Cowell Boulevard to Montgomery Avenue. What to expect: This project will have major impacts to drivers, walkers and people on bikes. However, impacts will be limited to block-long construction zones. Planned construction dates: May to Nov.
Project description: Improve access along the Covell corridor by constructing a safer grade-separated crossing at Covell Boulevard for residents living and working in the Cannery development. This project will also make improvements to the existing path along Covell Boulevard which will reduce the slope of that path to F Street, making the path compliant with the Americans with Disability Act (ADA) requirements for a shared-use pathway. Construction location: This project includes work on Covell Boulevard between F and J as well as the F Street path between the Little League path and Covell Boulevard. 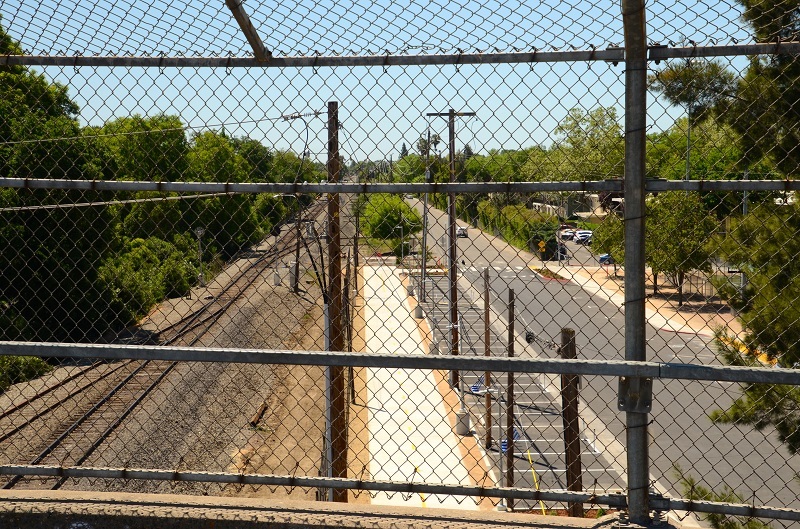 What to expect: The Covell path on the south side will be closed for biking and walking. The F Street path from the Little League path to Covell will be closed. There is no sidewalk on the north side of Covell Boulevard adjacent to this project so people walking and biking will be detoured from F Street and J Street to Drexel Drive. There will be vehicle lane closures for extended periods of time along Covell Boulevard limiting the roadway to a single shared use lane for motorists and people on bikes in both the eastbound and westbound directions during the course of the project. Planned construction dates: Mid-May to the end of the year. Improvements on H Street and Bike Loop along Little League field. Photo credit Johan Verink. Construction location: Three deteriorated asphalt paths will be converted to concrete paths. Locations include Covell Park, from north of the Covell bike/pedestrian bridge to south of Huerta Place; In North Davis along the North Star perimeter path between the North Star greenbelt path near the Covell Drainage Channel and north of Harrier Place; Along both sides of Alhambra Drive, between Caricia Drive and Arroyo Ave.
What to expect: Bikes and pedestrians will be detoured. Planned construction dates: Mid-May to Oct.
After reading this list you are probably thinking, how am I going to get around this summer? 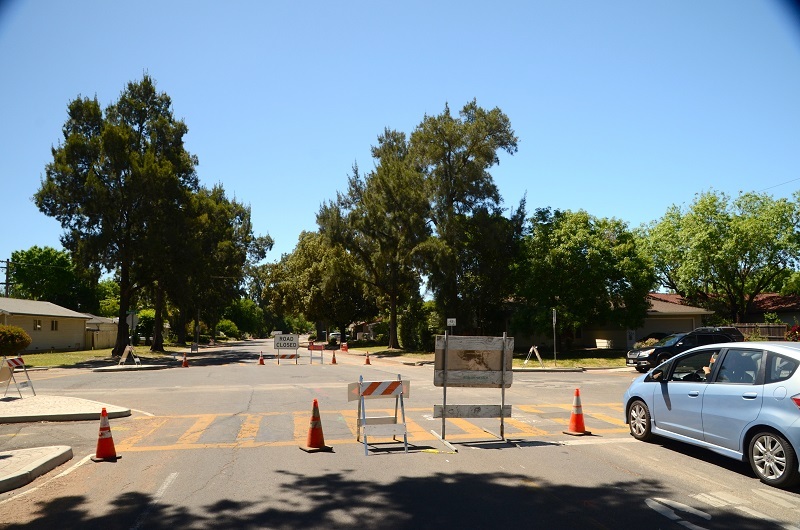 Here are some tips for traveling in Davis during the construction. * Plan ahead — knowing that a route you normally take is under construction you might need to add more travel extra time to get where you are going. * Be patient and extra courteous to others. * Pay attention to the traffic control signs and people directing traffic. * Use safe speeds in construction zones. This applies to both motor vehicle drivers and bicyclists. * If a sign says to “walk your bike,” please comply with the sign. * Don’t bike the wrong way on a street to avoid a detour. * Follow the detour signs. Don’t cut through apartment complexes or on private streets to avoid a detour. When these projects are complete, you will love to bike, walk and drive on these improved pathways and streets. This is a very exciting time for our city to have so many projects under construction. If you want to learn more about these transportation projects please contact Michael Mitchell at mmitchell@cityofdavis.org. If you have questions and comments about biking and walking in Davis, please send your questions and comments to jdonofrio@cityofdavis.org. — Jennifer Donofrio is the city of Davis’ bicycle and pedestrian coordinator; her column is published monthly.